The spring is getting closer every day though we still have snow in Húsavík. Yesterday news spread about the arrival of the first puffins of 2019 in Grímey island. That means that it won’t be long until we’ll see the first puffins arrive to Puffin Island in order to breed and then feed their young ones. Today was the season premiere for Húsavík Adventures, the third out of four companies in Húsavík to start their season this year. It’s the fifth season for the RIB whale watching company which began it’s history in the middle of 2015 summer. 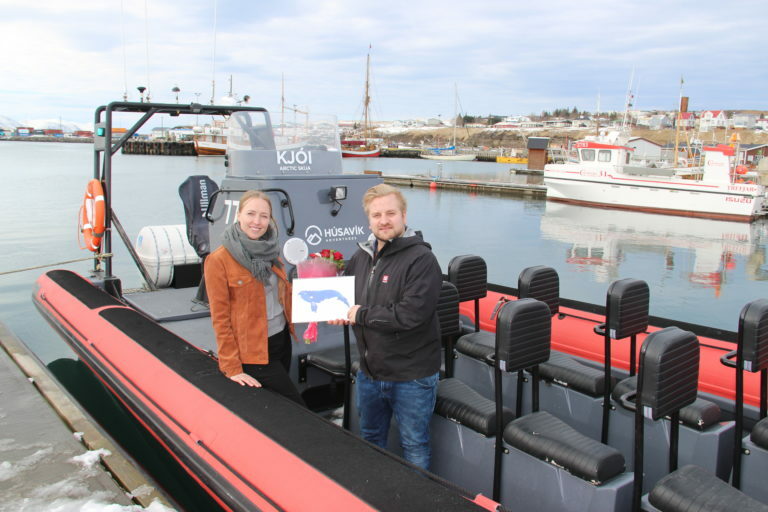 For this occasion, the Húsavík Whale Museum manager Eva Björk Káradóttir gave flowers and a drawing by Renata Ortega to Húsavík Adventures’s manager Ármann Örn Gunnlaugsson.